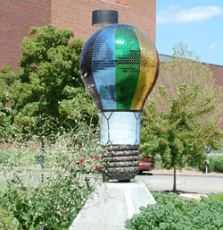 The Lighthouse Foundation public art project featuring 6 foot tall, 120 lb, light bulbs has, by now become common knowledge. 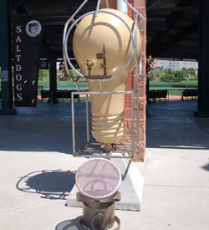 What isn’t as well-known by everyone are the artists behind the craftsmanship and beauty of the one of a kind bulbs. 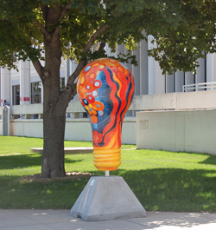 Although there are 51 light bulbs in total throughout Lincoln, Downtown Lincoln has the privilege of highlighting one in particular, Light through the Trees, designed by Downtown Lincoln’s very own Janna Harsch. Janna has officially been a member of the Downtown Lincoln Maintenance crew or “Green Team” for two years. 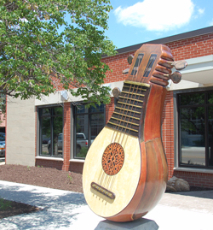 Over her time Downtown, her art has been heavily influenced by the trees and foliage that she works to preserve on a daily basis. 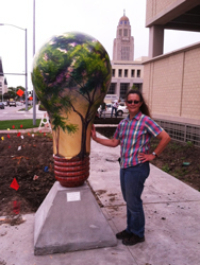 “My piece Light through the Trees shows five types of trees that are common in Downtown Lincoln,” Janna explained. The Red Oak, Golden Rain, Honey Locust, Kentucky Coffee, and Ginko are all incorporated into her design. 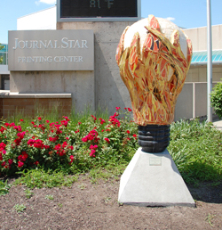 Janna explained that she has always wanted to be a part of a public art project and submitted two bulb proposals for the Illuminate Lincoln project. Both were accepted, Light through the Trees and Light out of Dark, which was a joint art project by Artists on the Edge. 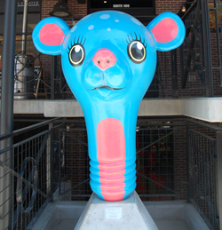 Light through the Trees was sponsored by Rembolt Ludtke and is located at 12th and K streets near the Landmark Center. 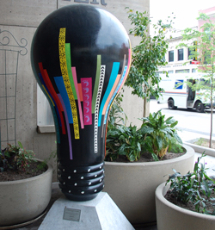 Janna’s light bulb is one of 8 bulbs in the Downtown area shown below.